Last weekend, we joined a few thousand of our new friends on a journey like no other, a journey into the future of several of our favorite things. 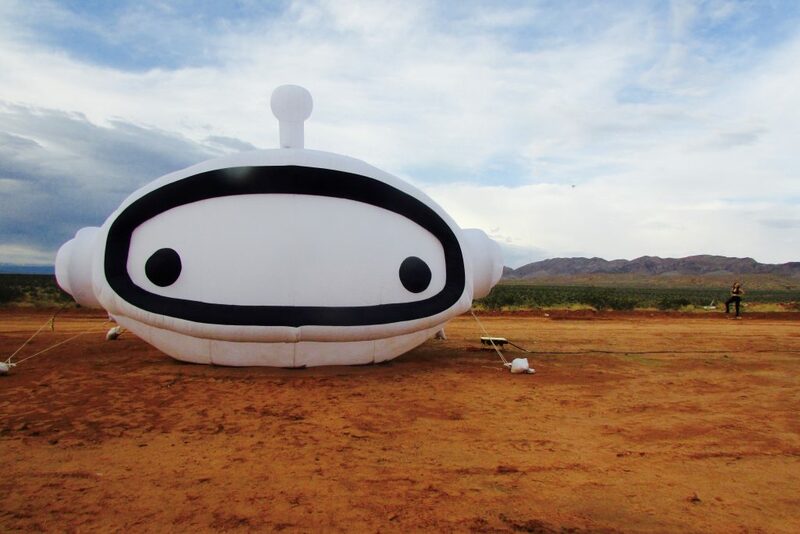 Further Future‘s second voyage, FF002, took place at the beautiful Moapa River Indian Reservation just shy of an hour outside of the Las Vegas strip. The peaceful trek down the quiet highway (full of RVs, no doubt headed our way) led to our first glimpse at the festival grounds, a pristinely-laid out space of land carefully drawn out of the sprawling desert. From sunset to sunrise and over again, the experiences, feelings, and people we encountered were nothing short of magic. Here are a few of our favorite festival finds. The Art was interactive, sensible, and like the rest of the event, community-oriented. 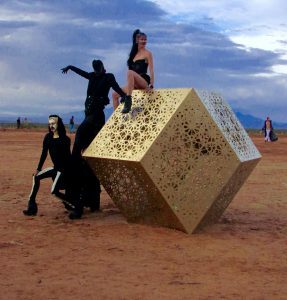 Larger-than-life geometric sculptures dotted the landscape, Twistedlamb brought her dark visions to life with a stunning cast of characters who roamed the sunset, and a fantastic installation by ArtIsMobilUs encouraged everyone to pick up a paintbrush and leave a representation of the future they wish to create. The Food was nothing short of amazing. From some of the best phở we’ve ever had (and had many times throughout the weekend) from District One to fresh-cut organic fruit from The Intuitive Forager and indulgent decked-out fries from the iconic truck Poutine Your Mouth, there we something for everyone. 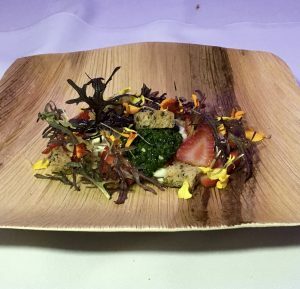 We were in for a real treat on Saturday night when we got enjoy an elegant 4-course family-style meal from Chef Jason Neroni of Venice, California’s Rose Cafe. The craft beers and cocktails we sampled were delicious as well, and WTRMLN WTR rescued us from sure dehydration. The Fashion was mind-blowing. Never have we seen such a fearless group of people expressing themselves through costume. 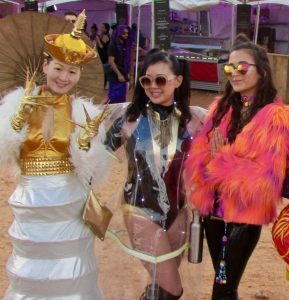 Each attendee found a way to dress to the 9s while breaking out of any sort of norm and expressing themselves uniquely. There was an excess of moon boots, faux fur coats, leggings, shoulder pads, bedazzled everything, el-wire to light the night, and smiles. It warranted a coffee table book we’d like to have. And of course, the Music was non-stop outstanding. Each performer brought their A-game to the five stages. The main stage, or Mothership, featured next-level visuals to coincide with the sounds of headliners such as Caribou and The Pharcyde, who we were delighted to see rock the receptive crowds. 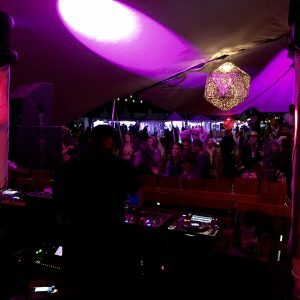 We took a special liking to The Void – the only stage housed in a tent which was surrounded by mattresses, featured several geometric chandeliers, and churned out hypnotic beats from new and old loves such as Terry Francis, Anchorsong, Inland Knights, and Talal. After sunset, lasers filled the skies with vibrant signals of sonic adventure. As music makers and fans and well as event professionals, we must tip our hats to every single person part of the production team of FF002. We didn’t hear one sound hiccup, the entrance process was the most painless we’ve gone through in years, and the severe weather situations – any event’s worst nightmares – were handled with respect. Hats off to the attendees as well for following along when things got wet and going the extra mile to ensure the leave no trace policy was kept up. Bravo, Further Future! We can’t wait to come back next year. More peeks into our journey coming soon.